-- Select a Size/Color -- X-Small - Out of Stock! Small Medium Large - Out of Stock! Take your dog out to the gridiron for some fun in this officially licensed Dallas Cowboys Hooded Dog T-Shirt! 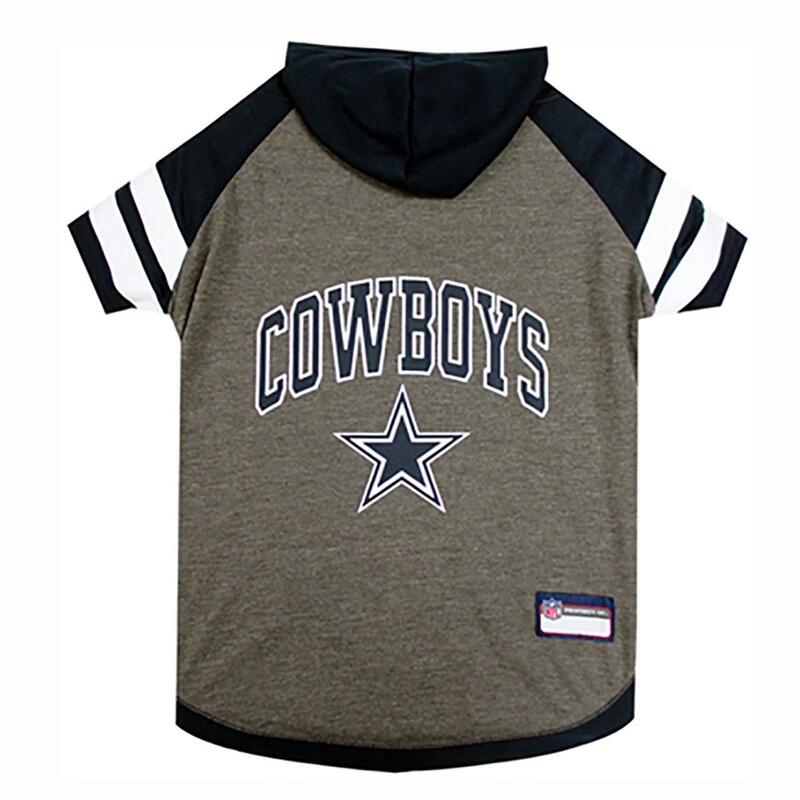 Your little running back will love being cozy and supporting their favorite team in this Official Licensed Hooded Dog T-Shirt! Tee features the team name and logo screen-printed on the back with the NFL woven patch. Stripes on the sleeves. Made of 100% polyester. Great for tackling your day year round! Posted On 07/16/17 by Melissa M from Albany , NY Yes, Melissa M recommends this product! I really loved the shirt for my buddy. It is a little snug on my black lab, but it still will work. I would probably need to order a bigger one next year. Posted On 04/01/17 by Jesus M R from San Angelo, TX Yes, Jesus M R recommends this product! Posted On 03/07/17 by Jesus M R from San Angelo, TX Yes, Jesus M R recommends this product! Posted On 01/14/17 by Sierra V from New Franken , WI Yes, Sierra V recommends this product! Posted On 01/05/17 by Reginald D from Granada Hills , CA Yes, Reginald D recommends this product! It is the best place to purchase ur pet products. It fun to shop there. Love the website.